My Creative Existence: Tissue Tape Techniques Class! In this class I will show you a number of ways to use the new Tim Holtz Tissue Tape on your cards. You will create 4 beautiful cards that can be used for any occasion. 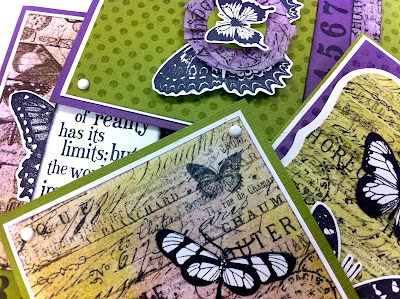 Your cards will also feature beautiful stamps from Tim Holtz and Darkroom Door. We will also be using the new Distress Stains from Tim Holtz, so if you've been wanting to give these a go, then this may be the class for you! Tissue Tape Techniques with Sarah Schwerin - $30. Saturday 30th July - 10:30am to 12:30pm. Tuesday 9th August - 10:30am to 12:30pm. To book, please call Pages 2 Scrap on 1300 664 228, or click here to book online. I look forward to seeing you in a class soon! mmmmthis sneeeek peeeek looks yummy. beautiful creations Sarah! Wish I lived near you!! I also love what I can see--would love to see the full cards. Will you post them after your classes? Hi__ I was directed here from pinterest- Do you have full photos of these cards--loving what I see! :-) My email is doinglifewithgod@gmail.com.